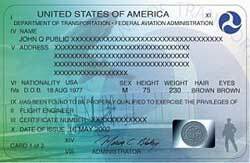 There are several different kinds of airman certificates and ratings issued by the FAA. We will go over each one below. A typical pilot looking to get hired by the airlines will usually get the following certificates and ratings in the order listed below. There are no special requirements to obtain a student pilot certificate. A student pilot certificate never expires and is issued to anyone that is learning how to fly. You can start your flight training without this cetificate but you will need it, and at least a 3rd class medical certificate before you solo. It typically takes about two weeks after you apply to get your student pilot certificate. It's a good idea to apply for your student pilot certificate and get your medical certificate at the start of your training to avoid delying your first solo flight. The student pilot certificate allows you to fly alone under specific, limited circumstances so that you can meet the requirements for your private pilots certificate. To solo an aircraft you need to be at least 16 years of age. You can start flying before your 16th birthday but you can't solo until you reach 16 years of age. The sport pilot certificate has limited privileges mainly for recreational flying. Some of the restrictions are; you can only fly a light sport aircraft, have no more than one passenger and only fly during the day. If you only plan on flying around your local area during the day, this is the perfect certifcate for you. If you want a lot more priveleges, the Private Pilot Certificate is the way to go. You also do not need a medical certificate as long as you have a valid drivers license. The recreational pilot certificate has some more privalages than the sport pilot certificate but still has a lot of limitations. You can fly a single engine airplane up to 180hp with one passenger during the day for pleasure only. With the private pilot certificate you can fly for pleasure or personal business without accepting compensation. This is the certificate that most pilots pursue. If your plans are to become an airline pilot, this is were you start. You can fly with passengers during the day and night in many different types of aircraft. The instrument rating allows you to fly in instrument flight rules. You'll rely on the instruments in the aircraft to get you to wherever you are going. An individual who may, with some restrictions, fly for compensation or hire. Once you complete your private pilot certificate you will either work towards your commercial pilot certificate or the instrument rating. The commercial pilot certificate allows you to get paid for flying under certain circumstances. This doesn't mean that you can jump in your airplane and have someone pay you to fly them somewhere. A multi-engine rating is required to fly an airplane with more than one engine. It is the most common example of a class rating. If you want to become an airline pilot then you will have to get your multi engine rating. You will also need to build at least one hundred hours of multi engine time before any commercial operator hires you. You are better off building as much multi engine time as possible. Commercial operators look for multi engine time experience because most of the commercial flying you will do is in airplanes that have more than one engine. A instrument instructor rating authorizes a certified flight instructor to give training and endorsement for an instrument rating. A multi-engine instructor rating authorizes a certified flight instructor to give training and endorsement for a multi-engine rating. This is also a great way to build your multi engine time. An individual authorized to act as pilot in command for a scheduled airline. The airline transport pilot certificate allows you to operate as a Captain for an airline or private charter. Most airlines will not hire you until you acquire the atp certificate. The ground instructor certificate allows the holder to offer various kinds of ground instruction required of those seeking pilot certificates and ratings. Browse our huge list of Aviation Schools now!